Randonneuring is self-supported long-distance cycling. It's a great sport for those who love to ride their bikes, explore new roads, and discover what is over the next hill. Our rides are scenic and challenging. Perhaps most enjoyable is the camaraderie among randonneurs. Randonneuring is not a race, but the time limits makes it challenging nonetheless. Randonneuring celebrates self-sufficiency. On a brevet or a permanent, you are on your own ride. The self-sufficiency of randonneuring means that you are responsible for your own pace, your own nutrition, your own repairs, and, above all, your own safety. Although other riders, or the organizers, may offer assistance, the ultimate responsibility lies with you. Randonneuring is a big tent where every rider finds their challenge. Some aspire to finish within the time limit, others try to set a personal best, and yet others want to go as fast as possible. Some concentrate on the longest distances (1000 km and beyond), others do the day rides (100, 200 and 300 km). All are randonneurs. 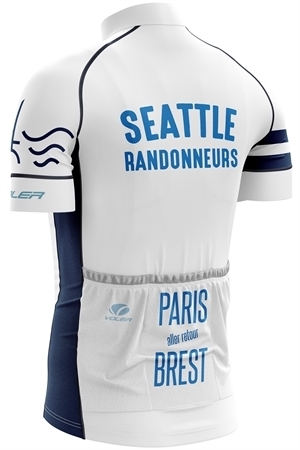 At Seattle International Randonneurs, each rider is respected. We are all out to have fun! Randonneuring rides (called populaires or brevets) vary in length between 100 km (62 miles) and 1200 km (750 miles). Riders are given a route sheet and a control card, which they have signed at predetermined points to show that they have completed the course. Check our calendar for upcoming populaires and brevets and come join us on a ride! We also have a library of routes, many of which are available on a permanent basis. 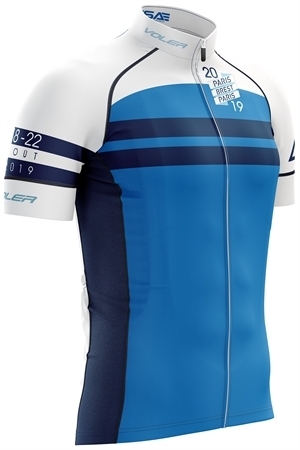 Our 2019 PBP jersey was designed by SIR rider Kate Hotler. We're stoked on this design! You can get yours at the link below—but don't delay as orders close May 13. In addition to several other styles, Voler will offer a women’s only Classic jersey option without elastic at the waist and sleeve ends. Once available, unofficial ride results will be posted here. Official RUSA results postings can be searched here. Below is the SIR Google Calendar which lists brevets, populaires, team rides, and other events. ACP/RM dates are fixed, but we can add RUSA events (including Dart Populaires!) if there's interest. Use the Upcoming brevets list above to find ride information and to register. The Google Calendar shown below is just to help you save the dates. You might notice placeholder names like "Summer 400K" on Google Calendar, but they're the same rides as the more specific names listed elsewhere.